In three months, much has changed in my house and the children followed not without complaint and the path will be long because it is not a lifestyle that is taking place in just three short months but we suitable for all five. I wanted to make a little balance to celebrate the three months that I hope will inspire you to try and change if you want in this lifestyle. It is not exhaustive, it lacks lots of things but it's 32 very important and interesting points. - I do not do my shopping at Leclerc, I accompanied my husband from time to time but I do not feel myself at ease. - I shop at Biocoop and I buy everything in bulk or on organic and local farmers markets. - Buy as local if possible more than that must be organic to run my area of ​​activity. 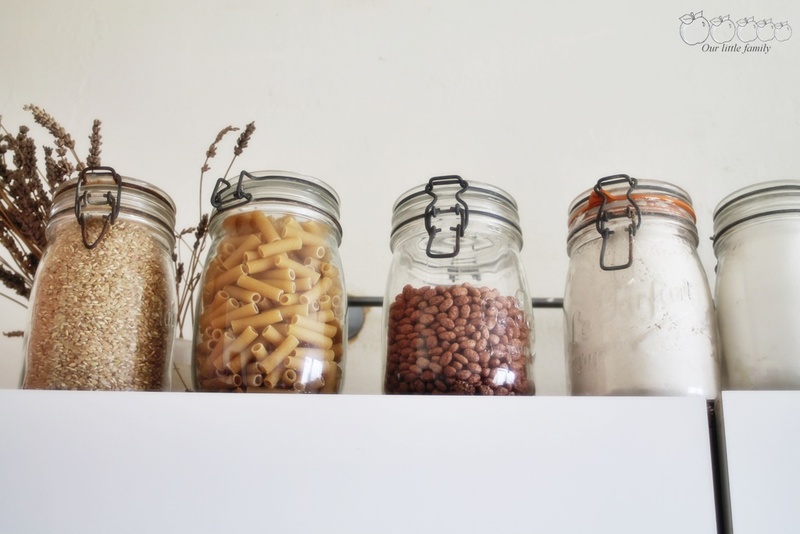 - My house is filled with glass jars perfect that sits proudly at the top of my kitchen cabinet. - I sorted out my kitchen and 90% of which was plastic and I've donated and instead I mottled glass containers. - Hardly used the car and we leave the bikes every night. - It uses more plastic bag but cloth bags. - I refuse the maximum possible waste from outside whether plastic or cardboard. - We eat meat once or twice a week, it is gradually becoming a vegetarian. - We bought two chickens and a coop for our organic eggs straight home. - Our garden was revived as every year (this is not a change). - It avoids to the maximum waste, and now our garbage out once every three weeks. - I hardly buys more "material" in nine, I now opt for opportunities either via Emmaus objects or via flea markets. - I hardly buy anything since I became minimalist, it makes great savings. - I have emptied the house but much remains to be sorted but I already have a bathroom and a minimalist kitchen. - I limit our electricity and water consumption. - We now have all minimalist dressing which allowed me to combine all the clothes of the house in the same room. - I make my cheese and yoghurt my myself based on kefir milk. - I still make myself my bread and taste them. - Now I make my jam because it consumes a pot weekly. - Sir, uses fresh sandwiches and buys more industrial sandwiches. - For birthdays girls, we opted for non-materialistic gift or two weekends, one in a castle and one at Futuroscope. - We use our compost although hens do the majority of work on recycling. - We have put a stop advertising on our mailbox. - I enrolled in my first lecture and in addition is that of Bea Johnson zero waste. - I do my own laundry and I no longer use chemicals to clean. - I try to fix the maximum property that I have for them to last as long as possible to avoid the opportunity to buy or nine still avoid polluting and again. - I use cloth handkerchiefs and paper and I pack picnics in rags rather than in plastic. - My mailbox is empty and I limit my time on the net, it's not perfect yet to that point. - There is no poo for our hair for 13 months so no shampoo on our heads. - Can I try to recycle an object before throwing the example our old garden shed gave wooden fences in the garden.